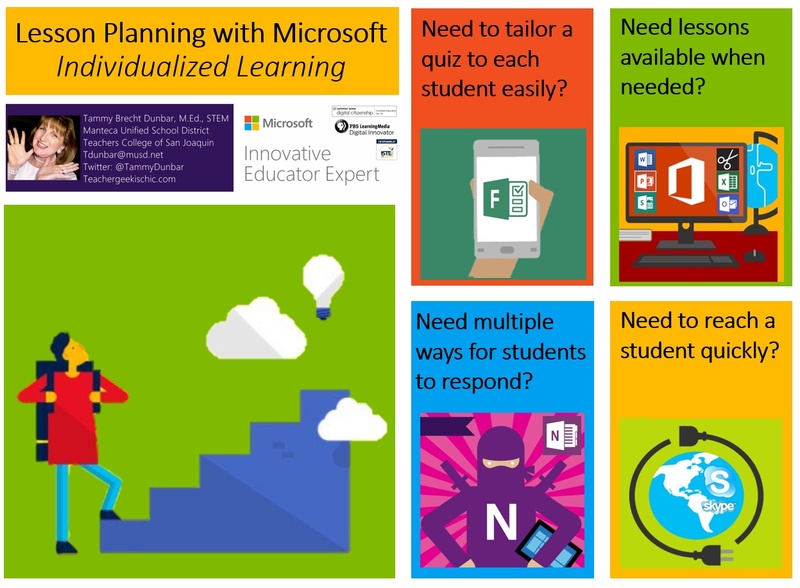 Lesson Planning with Microsoft: Individualized Learning | Teacher Geek is Chic! The young ladies at Table One quickly informed me they had Skyped with her that morning before school. The absent Emily was in 60 miles away, staying with her aunt while her parents were away on a long weekend trip. “See if you can get her back on Skype,” I asked her table group. Within five minutes, there was Emily, smiling at me on the screen. After explaining she hadn’t known until late last night that she was going to be absent, she asked how she would make up the big writing assignment. I told her she could do her assignment right now on Microsoft Word, attach it as a document to an email then send it to me. I emailed her the prompt for the assignment and before lunchtime, she had turned it in digitally. Some students need extra instruction, some students need different platforms, and some students need alternative ways to submit their work. Every student in my class learned that day how easy it is to use technology to get work completed and turned in on time. This is not only how technology can work in education, it’s how technology works in the real world. The only thing necessary for success is time to learn the right technology for each student’s needs and how to maximize what it offers. This is the third in a series of blogs about how best to harness the power of Microsoft tools for lesson planning. 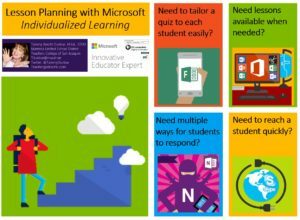 (The first was: Lesson Planning with Microsoft: Introducing the Lesson, and the second was Lesson Planning with Microsoft: Assessing the Lesson!) In this series, I explore best practices, pedagogical applications and share actual examples anyone may use and/or adapt. To learn more about how to use these free tools, go to the Microsoft Educator Network. And if you have some ideas of your own, please share them in the comments below! Forms: With its new Branching feature, Forms becomes a powerful tool to adjust digital instruction as a student takes a Forms review or test. Branching is when algorithm sets up an “If/Then” environment, for example, if a student picks one answer, it will take that student to another question. If that student picks a different answer, it will take that student to a different question. Using this feature, it’s easy to set up a review or test in Forms so that if a student, for example, misses a Math question, it will take that student to an easier question. If that student gets it correct, then that student is taken to another, perhaps more difficult problem. If a student misses several in a row, it’s easy to then send that student to a website to review the method to solve that particular problem, then come back to tackle it again. To see how to set this up, go to my Docs.com page to Individualized Lessons: Branching in Microsoft Forms. Snip & Office 365: Sometimes, students need to be able to review lessons when and where needed, and Office 365 and Snip offer wonderful opportunities to set up our own little academies for just that. My favorite tool for this is Snip, which has a whiteboard feature I use when giving the Math lecture of the day. Snip captures my digital inking and my voice explaining the day’s concept, then allows me to send it to our Class OneNote or even email it to specific students. 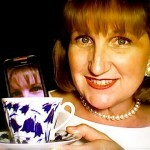 To see how easy this is, go to my Docs.com page to Hack the Classroom: Snip to Flip! And if your students have an Office 365 account, you can easily share online PowerPoints, Excel files, Word documents, Sways, etc. with them. OneNote: Classroom OneNote is the perfect platform for students to turn in assignments in any format they find useful, whether students prefer talking about their opinions, writing them down, or showcasing them through digital art. And with its incredible new Learning Tools add-in, students with reading challenges can manipulate reading material to make it more comprehensible by breaking down words into syllables, blowing in more spacing between words and lines, increasing font size of text and more. To see examples of this, go to my Docs.com page to Differentiating Lessons and Learning with OneNote. Skype: What better way to help your students with their work than being available to them when they need you? 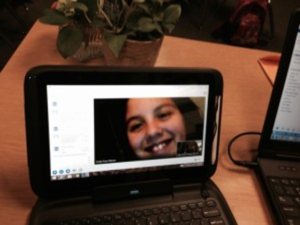 If my students see me logged in on Skype before or after school, they know they can reach out and ask me questions. If a student is absent, he or she knows to Skype in to someone in the class who will then walk their device over to me so I can chat with the student about making up work. How nice is it when a student misses school, but because of technology, comes back to school not having missed any instruction or assignments?